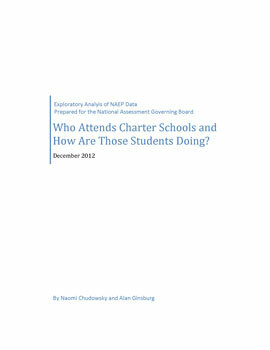 This report examines what the National Assessment of Educational Progress (NAEP) can tell us about charter school enrollment and student performance compared to that of regular public schools. The study uses NAEP reading and mathematics data from 2011 and the earlier years when charter school data first became available (2003 for grade 4; 2005 for grade 8). The study finds that while charter schools still account for a relatively small percentage of overall public school enrollment (about 3%), this percentage is growing rapidly, particularly in large cities. A sizable jump was found in charter school enrollment for the black student subgroup. In terms of achievement, there is a consistent pattern of higher average NAEP scores for regular public schools than for charters when we look at the nation as a whole. However, the closer we focus in on large cities, where most charter schools are located, the more the picture changes in favor of charter schools. In all large cities combined, student achievement is roughly even overall, but the black and Hispanic subgroups show higher scores in charter schools. When we examined four urban areas specifically (DC, Atlanta, Chicago, Milwaukee), students in charter schools significantly outperformed their peers in regular public schools in many of the subjects/grades analyzed. Charter school class sizes are smaller, and there is some evidence that charter school students receive more instructional time in some subjects. The report recommends making some changes to the NAEP Data Explorer interface and including data for research purposes in the Trial Urban District Assessment (TUDA) database that is representative of all charter schools located within each participating urban district.